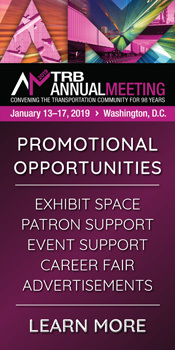 TRB's Airport Cooperative Research Program (ACRP) has released a request for proposals to develop content for three issues of a new ACRP periodical, which will have the latest content and updates regarding select transformative technologies at airports. Proposals are due January 29, 2019. TRB's National Cooperative Highway Research Program (NCHRP) has released a request for proposals to develop guidelines for the use and placement of the 31-in. MGS adjacent to curbs under MASH TL-3 impact conditions. Proposals are due January 30, 2019. TRB's Airport Cooperative Research Program (ACRP) has released a request for proposals to develop a playbook for airport leaders and managers that will provide readily implementable techniques to enhance talent cultivation and knowledge transfer within airport organizations. Proposals are due by January 31, 2019. TRB's Airport Cooperative Research Program (ACRP) has released a request for proposals to develop guidance to assist academia in preparing graduates for careers as airport industry professionals. Proposals are due February 6, 2019. TRB's AIrport Cooperative Research Program (ACRP) has released a request for proposals to produce a report that assesses the potential impacts of Urban Air Mobility (UAM) on airports of different sizes and having different levels of activity. Proposals are due February 5, 2019. The Iowa Department of Transportation has released a report that determines methods to increase transportation coordination in order to improve the efficiency of programs used to finance public transit services. Coordination allows Iowa to provide transportation services to its citizens while using public funds efficiently. The Mineta Transportation Institute at San Jose State University has released a report that discusses the effectiveness of “See Something, Say Something” campaigns on public transportation systems. This report analyses the effect of these campaigns on train, track, bus and road attacks between 1970 and 2017 throughout the world. The Institute of Transport Studies at Monash University has released the latest issue of its bimonthly newsletter, which is designed to highlight recently added items to the World Transit Research database. This edition features research on planning, operations, technology, and more. The International Transport Forum has released a report that reviews government support measures for domestic air connectivity in Australia, Canada, Japan, Norway, Sweden, and the United States. This report analyzes different approaches to providing regional connectivity in terms of their effectiveness in achieving government policy goals. The International Transport Forum has released a policy brief that summarizes the state of the research regarding low-carbon freight. This report identifies ways to decrease the carbon dioxide emissions from the freight sector. The AAA Foundation for Traffic Safety has released a research brief that determines the relationship between visual functionalities and driving habits among older drivers. This study assesses visual-spatial abilities, contrast sensitivities, and visual acuity. The AAA Foundation for Traffic Safety has released a research brief that examines the use of potentially inappropriate medications (PIMs) in older drivers. Use of PIMs is fairly common in older drivers and often involves medications known to impair driving ability and increase crash risk. The American Public Transportation Association (APTA) has released a report that summarizes how travel patterns have changed as a result of new technologies and data capabilities within the transportation sector. Specifically, this report examines how public transportation agencies can manage mobility options in the quickly-changing landscape.